I have a slight obsession with nail polish. I don't know if it is full blown addiction because I don't necessarily have anything to compare it to, but lets just say, I could potentially start my own nail salon. 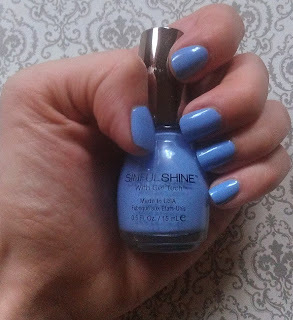 While that may be slightly embarrassing to admit, it goes without saying that you can never have too many polishes - and if you are anything like me, you change your polish on the regular to match your outfits, mood or just because you want to see what that color looks like "on". In my experience, I have good luck with the higher end "salon" brands in terms of longevity, ease of application, and color selection. Have you seen some of them? They literally have a color for every shade imaginable and the catchy names they come up with are pure entertainment. In reality, I can't afford to support my nail polish addiction with these high end brands. I could have probably paid my children's way through college if I cashed all those bottles in. Lucky for me, and you too (because why would you want to spend close to $10 per bottle? ), the SinfulColors™ brand has introduced their new collection: SinfulShine™ with Gel Tech™ which claims that it is "5x shinier than a patent leather shoe". There is nothing that compares to an at-home manicure that shines the same way a spa manicure does, aside from the price tag on it. 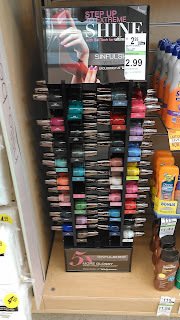 This collection is available at Walgreens where you can fill your cart (or basket - however you roll) because these gems only cost $2.99 per bottle! They even get their own display! Follow SinfulColors™ on Facebook and Twitter to keep up-to-date with all of their innovative products, or visit their website to try on all of their colors (with their virtual tool), view all of their collections, and even get some nail art tutorials! Disclosure: I received this product for free from Influenster for testing and review purposes. All of the opinions stated here are my own.